The spring and summer of 2011 was a busy time in my life. I was 23, and I was getting ready to graduate with my Master’s degree. You could say I was nearing “true” adulthood, something I had been determined to put off as long as possible. If graduation wasn't enough, I was also a newlywed, and I really had no plan and no real direction. Looking back, most would probably attribute my impending success to dumb luck, and I wouldn't necessarily disagree. You see, as my graduation neared, I had only applied for two jobs. One, at a fortune 500 investment firm and another at a local private university. That's it. My entire future hung in the balance, and I had only applied for two jobs. I had no back up plan if both fell through. Lucky for me, things have a funny way of working out. While I waited to hear back from these interviews, I was doing a short internship for credit in order to finish up my degree. I was on my last day of the internship, about two hours away from being jobless and in the “real world,” when I got the call. The university I had applied to offered me a great job with a starting salary of $43,000, which I (of course) accepted without countering. I was slated to start work in July (2011), just a few days after coming back from my honeymoon. My first year went by smoothly and without incident. I was at the bottom of the totem pole in my department, but I worked hard and did what I needed to do. I started out making $43,000 a year, which to me was a lot at the time, considering I was made $800 per/month while in graduate school. At the conclusion of my first year, the university gave out across the board 2% raises. During my second year of work, I received a great opportunity. I could apply to teach (on the side) for the university, and they'd pay me extra ! I took a chance and by September 2012, I had earned my first side income ($3,000). The university, again, gave out across the board 2% raises. During my third year, I got lucky. Our department consisted of three people and one of them was leaving. This meant I would be given more responsibility, which I gladly accepted. After a few months of taking on added responsibility (we didn't replace the person who left), I had positioned myself as critical to operations. The university really couldn't afford to lose me. Knowing this, I asked for a $6,000 raise, which I was given. Due to the raise, I was not given the 2% across the board raise. I also taught another class during my third year, making an additional $3,000. Nothing special happened during my fourth year. I continued to work hard. I taught another class on the side, which earned me $3,000 in side income. The university gave another 2% across the board raise. During my fifth year I received a promotion to “Director.” This new title and status allowed me to continue to demonstrate my worth and cement my status as an essential employee. In addition, I asked to teach more classes on the side, which they were happy to allow. I taught three classes on the side, netting $9,000 in side income. The university also gave across the board 2% raises. In July 2016, after five years of hard work, and continuing to cement myself as a critical employee, I asked for another raise at the beginning of the school year. The university came through and gave me an additional $15,000 per year. I've also continued to teach more classes, with expectations to teach 6 total classes this year ($18,000 in side income). In the span of 5 years, I doubled my income. The increase in income has allowed me to pay off $40,000 in debt in 2.5 years, max out my retirement accounts, and save for my son's college. In addition, my dramatic increase in income has put me on a path to retire at the age of 40 ! You will never increase your income if you cannot demonstrate your value to your employer. I'm a firm believer that if you work hard and put in the effort, you will be rewarded. Yes, that's probably a naive way to view the world. However, my experience is that if you can demonstrate your value and become an essential employee, necessary to the operations of the organization, you will receive a return on that investment. In my case, that's what I did, and I received $21,000 in merit based raises over the course of five years. If you cannot demonstrate value, your income will not increase. 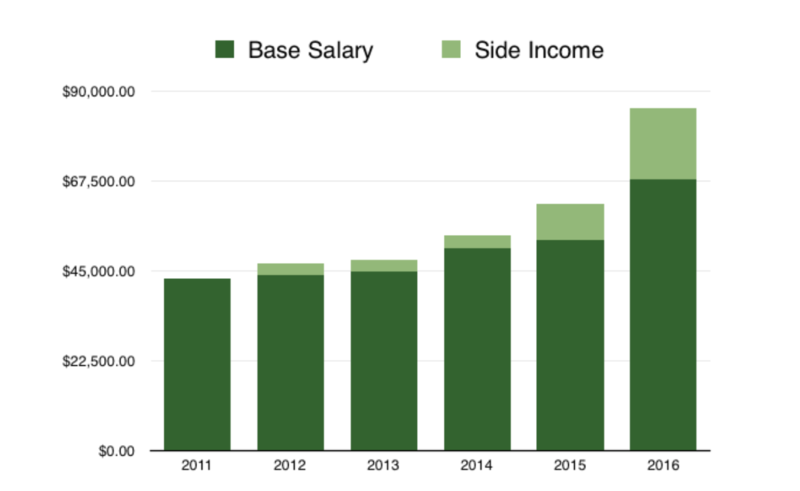 I've earned $36,000 in side income over the past five years ($7,200 per year). I was able to do this because I took advantage of opportunities that came my way. In 2012, I wasn't afraid to apply for my first side teaching gig, and I wasn't afraid to ask for more classes when that opportunity was presented to me. If you are too afraid to put yourself out there (e.g., apply for a promotion, start a side business, switch employers, move into a new career….etc), then you cannot expect to dramatically increase your income. In order to earn more income, you can't be afraid to ask for what you think you are worth. Before asking for my merit based raises ($21,000 total), I did research to find out what my pay should be. When I discovered that my job title/duties didn't reflect the income I should be earning, I presented this evidence and asked for more money. The worst thing they could have done was say no (or fire me!). You have to fight for yourself because nobody else is going to. Have you ever asked for a raise? Did it work? That’s awesome! And great to hear you have avoided lifestyle inflation and are instead on track with savings and investing. As an elementary teacher, my wages are not negotiable, but I can add to my salary by picking up extra curricular events, which I’ve done by coaching soccer. At this point, I’ve earned more coaching then I did during my first year teaching! Keep up the good work, and finish by 40! Thanks ! My wife is a teacher, too. I’m all to familiar with the salary schedule :). Congrats on your wild success! I think hustling is a great way to get a high salary. So much attention is given to side hustles in this community, that sometimes it’s easy to overlook the fact that you can “side hustle” at your current job and probably make a lot more money, faster and easier, than you would make picking up a second job delivering pizzas or driving for Uber. I, too, have asked for raises in the past, with distinct reasons to back up my request. Like you, I got them. There is no need to wait for someone to recognize your hard work. Everyone is concerned with themselves and their own career, even the bosses. Because of this, it never hurts to remind your superior how valuable you are to the company and ask for more compensation. Chance are, they’ll agree with you and you just might get it! Agreed. I found $15,000 in side income at my current job by seeking opportunity. I don’t know where else I could do that without a crazy investment in my time. Sam, congrats on your growth. What do you plan to do with your big bucks now?! I have very exciting plans for the money ! Continue maxing out my Roth IRA, 403B, HSA, and start putting more into my Vanguard accounts. Great post, love the detail and the recap of “lessons learned.” I think a lot of take too passive an approach to their life, whether it’s their income or other areas, glad to hear a story from someone who was actively making decisions and having positive outcomes. Good point. Maybe the “you’re fired” thing was more of a fear. Thanks for the comment ! I was able to double my income in two years, but it was by switching jobs often. It’s not a practice I’d recommend and wasn’t my plan, of course, but I managed to significantly increase my earnings a few years out of college. I guess I took a “the grass is greener” approach and demanded higher salaries at each new position (salaries that made sense and were warranted, of course). Nowadays I keep track of all of my accomplishments, including dates and email documentation. Whenever I have a chat with my manager about compensation, I have evidence backing up my request for higher pay. Changing jobs is certainly one way to do this. Great idea about keeping all of that documentation. This is a great article. Most people are too afraid to put themselves out there and ask for a raise. You are worth more than you think. Thank you for sharing your story. Congratulations! I have a friend whose following a similar career trajectory, and I often wish I stayed in the education field (unlike M$M). Still the lessons here are practical no matter what field you’re in. Don’t burn out teaching all those courses! Burnout is certainly possible. I teach a variety of classes, though. I think I’m safe ! I am about to do this, thank you so much for the tips and the story! As a woman, this seems to be something we’re at a disadvantage of learning how to do before we hit the workforce. I too, have found out that I’m making like $20k less than I should be and that’s a stretch to ask for, but it’s worth asking for. Luckily, I too have paid off my debt so the increase would really help me reach my savings goal. You also don’t have to ask for $20,000 to fill the gap. Maybe ask for the in-between number now and the rest later ? Very neat to see your progress. I quadrupled my income in the last 2years. It’s fun to be able to buy a house, save for retirement and travel. However, I never knew people in this income bracket paid so much in taxes! And suggestions? Thanks for the comment ! Max out all of your tax advantaged accounts (401K, HSA). This should help with taxes. That’s what we do. Thanks for the comment ! Being at the top of your field also helps with salary negotiations. Great post! Really enjoyed how you broke it down year by year to show the steady improvements. It goes to show that income can increase with hard work, building skills, and not settling. I think too often people get into a mindset of getting too complacent, it’s important to keep striving towards goals. Great job demonstrating your value to your employer and negotiating for what you deserved to be paid! Thanks for the comment. You are right, it’s important to look toward the future and figure out where you want to be in 5/10/15 years. Awesome guest post! It never hurts to ask! This shows that if you work hard at it and show your an asset you can set your own salary. I am sure a ton of people will benefit from this and maybe get enough courage to ask for a raise. Super Savvy and nice job! My comment is a little different – how do you feel about asking for a raise when you are already a high-income earner (>$120k). I thought I was paid very well, and I am happy with my income. However, I received an offer for significantly more money from a different company. I haven’t talked to my boss yet, and I’m not sure if I will. Thoughts? I think it depends on the relative salary of people around you honestly. Is your job one that could be replaced with a younger, cheaper worker (even if there would be a drop in production)? If so, it may be a good strategy to not over-inflate your salary so the company still feels that you are giving them the right amount of value at the position. Definitely a tough question though! I think it’s probably harder to “double” your income when you already make $120k. If you can earn more doing a comparable job at a different company (and it’s a good job), then why not ? My wife was in a similar position about a year ago. When she was officially offered the new job she went to her boss and told her that she was offered a job that paid significantly more. Her boss offered her a 10% raise to stay. That raise didn’t match the salary of the new job but since she was very comfortable and happy in her current position she decided to stay. Got a 10% raise out of the deal and didn’t even have to really ask for it. Worst case scenario they fire you, then you just take the new job. Doubt they would do that though, assuming you are a good employee. I was in this boat and I didn’t try to hold my current boss hostage for more money. I already felt like I was being paid a fair amount and I had pretty much no justification for the increase besides the fact that the new job would pay me more. I had made up my mind to leave at that point too. So, no I wouldn’t try to ask for a raise unless you really, really really 100% want to stay. Great advice. We live in a value driven society. You get paid for the value you create. Additionally, you have to show others (your boss) the value you have created so they can clearly understand and quantify it. And then, of course, you have to ask to be compensated for the value you bring. I’ve done something similar in my career. Lately I’ve come up with a list of initiatives that will create value for my company. Then I discuss them with our CEO, and specifically discuss the value they will bring to the organization. We then assign specific pay increases to each on, and off I go working to create more value for the company and myself. I increased my salary by 20% last year by doing this and have a goal to increase it by 15% this year taking the same approach. Great idea about listing ways you’ve added value. Thanks for the comment ! I needed to read this today. It’s so important to put value on your service, so others have confidence in what they’re getting. I have a local government desk job during the day, but I need to start upping the prices of my side teaching and speaking engagements I do on the side. Not to put a stereo type to it, but I think women are more apt to accept less. I’d like to go into this year not only putting a bigger dollar sign on my services, but also marketing the services with confidence. Go out and ask for what you’re worth ! Thanks for the comment. We loved hearing your story on how you doubled your income! The tips you gave at the end were all great as well! It is always a great idea to take advantage of every opportunity and teaching is a great side hustle option! There are so many other side hustle options to consider for those who aren’t in the education field! Thanks for sharing your story with us!